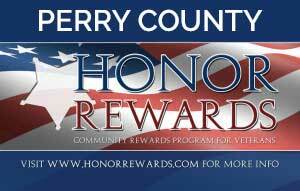 A free service that entitles our veterans for discounts and incentives at local businesses The Perry County Recorder’s Office, in partnership with Fidlar Technologies, is excited to announce a new service for our Veterans, known as, Honor Rewards. With Honor Rewards, Veterans can sign-up at our office or online to receive an Honor Rewards card, which qualifies them for discounts and incentives at participating businesses in our community. This service is being made available at no cost to the county and its taxpayers. To sign up, all a veteran needs to do is visit www.honorrewards.com, click on Perry County, IN and fill out the form with details on when they served and with what branch of the armed forces. If an individual prefers to fill out the form with us instead of online, they can visit our office during business hours and we will help them get signed up. A DD-214 Military Discharge is required to be recorded in order to verify Veterans eligibility. The service is completely free and after signing up the veteran can expect to receive their Honor Rewards ID card in the mail in 1-2 weeks. Local businesses and retailers can participate in the service by contacting our office or using the Business Sign-Up link on www.honorrewards.com. By participating, their business name will be listed on the Honor Rewards website for Perry County, provided to Veterans who receive an Honor Rewards card, and also be regularly mentioned in email blasts to current Honor Rewards members.